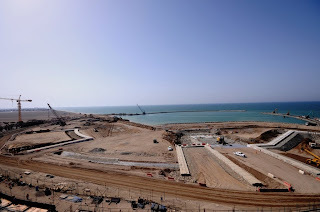 As I'm sure most of you know, Oman will be hosting the Asian Beach Games in Wudam Al Sahil near Mussanah (yet, rather strangely, the games are being advertised as Muscat 2010). The site is about an hour and a half drive away from Qurum, so it really is a bit of a stretch to say the games are being held in Muscat. However, after seeing the progress at the construction site, one has the question: Will this even be ready by June next year? I say June, because the official website from the Ministry of Tourism states that the athletes village will be completed by June 2010. Well, judging from the picture below, I'd say that the incumbent Contractor (L&T) had better accelerate it's work, or there very well maybe egg on some peoples faces. From the picture, you can see that the breakwater has been completed (Carillion Alawi are to thank for that). The rather alarming lack of Command Centre (the Press area), Marina Hotel and Marina Residences building, coupled with the fact that it is August 2009, does suggest that the intended completion date of June 2010 might be hard to achieve. But not impossible. Maybe. This other smaller picture is an elevation of what the site is intended to look like. I think either the Marina Hotel or Marina Residences building has commenced, because in the first picture you can see a little suggestion of work in the bottom left hand corner. Well let's hope that L&T wake up and get their finger out and start to actually get this project built. I remain positive that something will be ready, just perhaps not what was originally envisaged. The other point of note is that the games are scheduled to be held in December 2010 (source) and I'm sure that with those extra months, a lot of finishing touches will be completed. Speaking of sporting events, has everyone got their F1 tickets for the Abu Dhabu grand prix on November 1st? It would be very ambitious to think that it would be completed for June next year. ITS HIGHLY UNLIKELY , BUT NOT IMPOSSIBLE ..ACCORDING TO MY FRIEND WHO IS AN UNDERWATER DIVER WORKING THERE. Can't wait to see the throngs of men ogling at the women's volleyball events. It'll be a right old riot. The Clients are Omran. The project is being managed by Faithful & Gould, and the Architects are WS Atkins. I'm told that actually the Contractor has accelerated on site and that, currently, they are on schedule for 100% completion before the start of the games. I'm sure it'll be all right on the night. OIUS - haha - I suspect it will be! Nearly all games are seen by interested observors to be behind schedule . . . howw is the site now? L&T has done it.. The 2nd Asian Beach Games is a grand success..All credit goes to L&T only. Congrats L&T. We are proud of u.